Whitworths is a British baking institution, their products having lined the pantries of many a baker or home cook since the company’s creation in 1886. The name belongs to the three Whitworth brothers, who were flour millers. In 1953, some decades after founding their mill and starting to supply flour to local bakeries, the company moved with the times and started to use the milling equipment to spin, wash and dry dried fruit – literally a revolutionary concept for the time. Think about how popular fruit cake was back then and how many dried fruit ingredients used to go into each. Whitworths were bound for new success as suppliers of specialty sugars and fruits. Skip forward to the seventies, when Whitworths won Royal Warrants from both Queen Elizabeth, the Queen Mother, and her daughter, the Queen herself. Whitworths had now invaded the palaces of our green and pleasant land. Mergers and management buy-outs followed and the warrants seem to have disappeared, but nothing has shaken this firm. In 2012 it was voted the UK’s number one brand for dried fruits and is still leading the way with the extensive range of Whitworths healthy snacks, baking and cooking products. Cue July 2015 when I was fortunate enough to join a group of food bloggers and the Whitworths crew to do a bit of baking with their products. Our tutor? Holly Bell, finalist in 2011’s Great British Bake Off and blogger at Recipes from a Normal Mum. She’s gone from strength to strength since her time spent baking under the BBC’s bright lights and now makes regular appearances on This Morning and QVC – the shopping channel. First up – the kitchen. We were at a teaching kitchen in Wandsworth with a gigantic island and industrial-sized appliances. I lusted after the wall (yes, wall) of chrome-fronted fridges. There’s never enough room in our fridge at home and, although I love my kitchen, I have Big Fridge Envy. Note: we used Whitworths products for the first four ingredients, but they may not be available where you are, so do use your local equivalent. Double note: you can substitute different fruits and I really like digestive biscuits in my own tiffin, so if you’re not a ginger NUT, like me, use a different biscuit. Leave to set at room temperature, then cut into pieces using a sharp knife. I made a bit of a mess of my icing, so hid the evidence beneath a sprinkling of chopped nuts. It looked SO much better afterwards, thank Heavens. A dusting of desiccated coconut would work well, too. Even better ‘cos I love coconut. Then we popped our tiffin tins into those gorgeous, big fridges to help the setting process, as it was a muggy day. 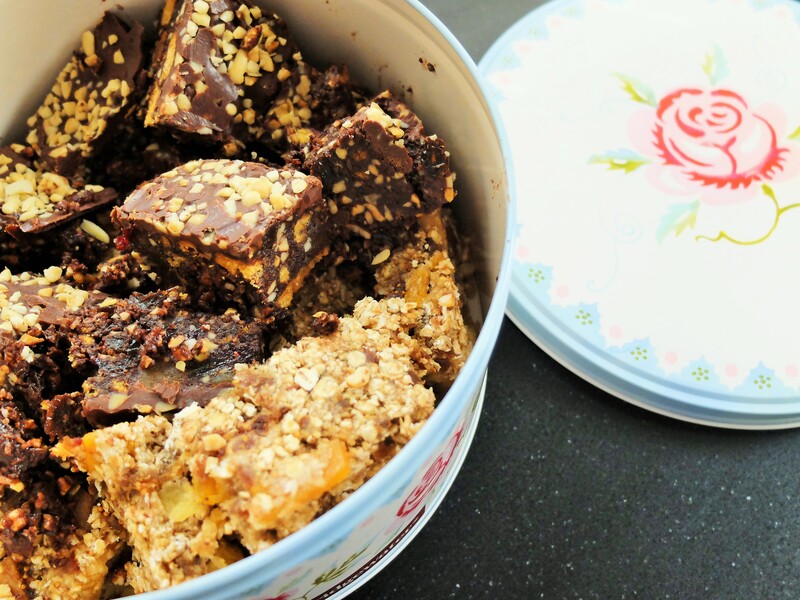 I kept mine in the fridge at home – and cool tiffin is even better than room-temperature tiffin, especially in this warm weather. Last note from me: to make it a really GROWN UP tiffin, add a dash of sweet sherry. It works so well with the chocolate and raisins. If the mix gets too sticky as a result, just add a few more crushed bikkies before pressing it all into the tin. **I’ll be trying out more of Holly’s baking recipes with Whitworths products as part of the #whitworthsbakingchallenge, coming soon. I’ll post my favourite recipes here, as soon as I’ve tried them out. Our lovely teaching kitchen, the Milan, was one of two at Venturis Table, just around the corner from the villagey Tonsleys area of Wandsworth.